“The future belongs to youth travel,” or so said a panel of tourism fundies at this year’s International Tourism Indaba in Berlin. For the younger generation, whose pockets aren’t as deep as their dreams are high, it can sometimes feel like adventure is limited to weekends spent watching the travel channel or longingly staring at that K-Way backpack when all they really want to do is go on a real adventure. Wanderlust is a serious predicament that inflicts most people at some point in their lives. Within each human there is this uninhibited urge to travel. We were not meant to stay in one place, and no-one feels this inherent urge to flee the nest more than the youth, and so the term “Generation Wanderlust” takes the stage. It is only natural then that a group of four 20-something Namibians (myself included), all nature lovers and avid explorers, took to the well-managed dust roads of the country we adore to prove that Namibian tourism is not only open to the foreign tourist with his traveller cheques in a moonbag, double extra-length camera lens and Lonely Planet notebook. We have set off on a mission to explore as much of Namibia on a shoestring budget, so join us in 2015 on our adventures: learn to speak Namlish, drool over our N$20 Wimpy breakfasts and laugh with us around a campfire after a Windhoek Lager or two. 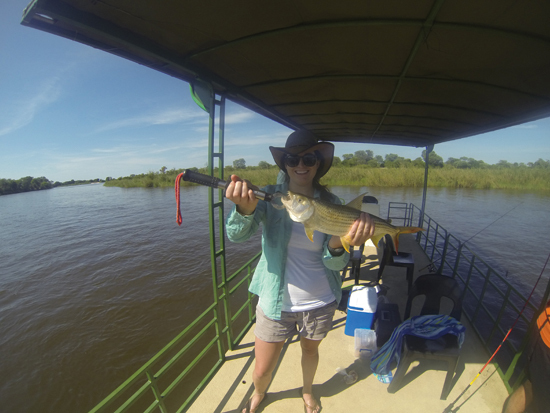 Our first expedition took us north to the Zambezi Region for a five-night stay at Ngepi Camp on the banks of the Okavango River. 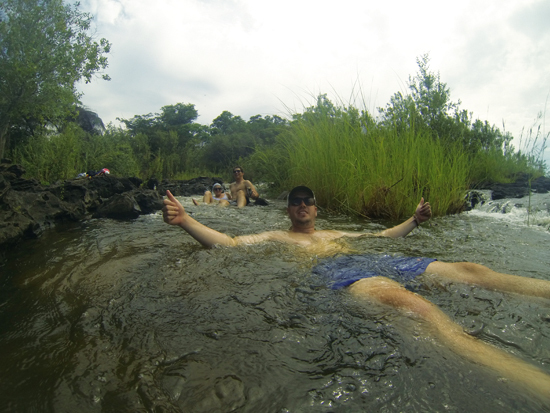 Our agenda integrated activities such as tigerfishing, crocodile and hippo cage diving and an afternoon lazing in the rapids of the Popa Falls. But above all these amazing activities, our two visits to the Mahango Game Park reigned supreme. At the heart of one of Africa’s most ambitious conservation programmes to date, the Kavango-Zambezi Transfrontier Conservation Area (KaZa TFCA) lies Namibia’s Bwabwata National Park. The park was established in 2007 by consolidating the then Caprivi Game Park and Mahango Game Park as well as a previously unproclaimed area along the Kwando River. The area, previously known as Mahango Game Park, now forms the Mahango Core Area of Bwabwata – Namibia’s best-kept secret. Wedged between the Botswana border and the Kavango River lies picturesque papyrus-lined channels, woodlands and floodplains that will completely reinvent the dry and arid picture you had of Namibia. 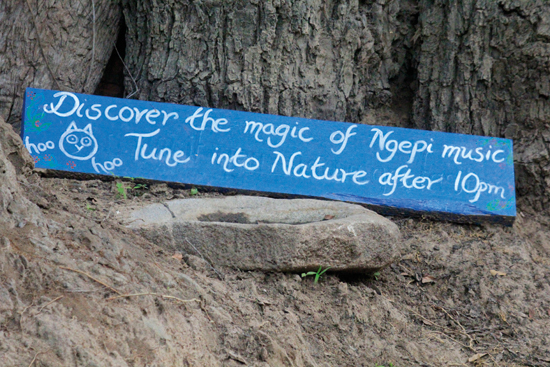 Like a Disney World for nature lovers, Mahango Game Park plays host to all our favourite characters. We were met with smiling faces as we stopped at the northern gate of the park on our first morning. The park’s main road also serves as a throughway to the Namibia-Botswana border post, so the park is open from sunrise to sunset every day. N$10 per person and N$10 for the bakkie secured our entrance and we were all too thankful that we didn’t have to dig too deep into our kitty. As we drove in we excitedly created a list of animals we would most like to see: buffaloes for Sean, elephants for Karin, Carmine Bee-eaters for me and a Chobe bushbuck for Abe. The park forms part of a critical migration route for African elephants moving from Botswana to Angola and Zambia. It is also home to more than 410 bird species as well as a wide range of mammals, trees and even butterflies. The park has two routes to choose from and we immediately opted for the western route. 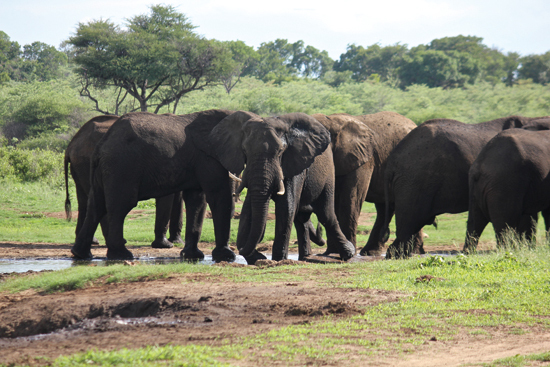 The western section of the park passes by the park’s main waterhole, which is where we spotted Karin’s migrating elephants. Tick. From here the route is accessible only by 4×4 drive vehicles, and is much less travelled. The 4×4 route allows for a much more rural adventure. Animals are quite skittish in the dense vegetation, and our first sighting of Namibian buffaloes was no more than a flash of dark bums and a rustle in the woods. Tick. Omurambas that create standing water pools for animals and enormous baobab trees that protrude above the woodland canopy characterise the eastern route. Plains game such as impala, kudu and zebra graze the green grasslands in abundance. The park is also home to more exotic game such as sables, roan antelope and tsessebes, who tend to stick to the more covered areas on the edge of the omurambas. 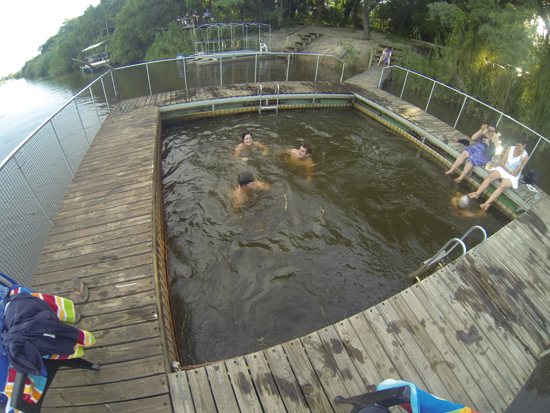 The eastern route also led us to a beautiful picnic spot, Kwetche, on the banks of the Okavango River. From here we could watch hippos yawning in the river and, with the help of some binoculars, spot hundreds of letchwe grazing along the riverbanks. 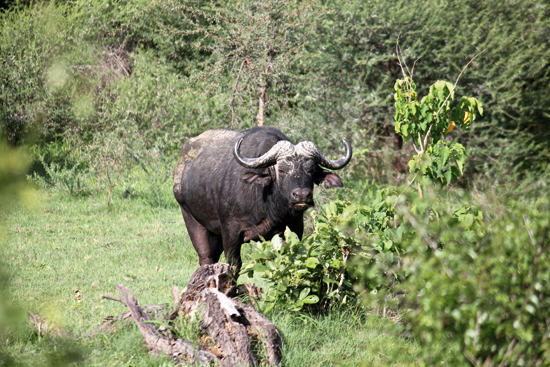 The eastern side of the park also treated us to many more sightings of Sean’s buffaloes, or “Voortrekker tannies” as Uncle Ernest calls them, with their turned up horns that resemble the caps worn by the women of the Dorsland trek. A Grey-headed Kingfisher perches on a branch as a tsessebe looks on in the background. Home to the largest collection of birds in Namibia, Mahango had me teeming with excitement as I searched trees and skies for the beautiful migratory Carmine Bee-eater. During the rainy season Carmine Bee-eaters are known to flock to the area in huge numbers, but all I was privy to was a quick flit of orange-pink wings as a bee-eater flew across the hood of our bakkie. I was lucky to be able to inspect it for 30 seconds through my binoculars as it sat on a nearby branch before it flapped off to a family reunion. This was more than enough time for me to be able to happily tick a new “lifer” off my list. Other amazing bird sightings we were equally lucky to come across included four different kinds of kingfishers, African Hoepoes, Wattled Cranes, a Marshall Eagle, a Wahlberg’s Eagle, as well as the all too popular sight of an African Skimmer gliding over the surface of the river with its bright red bill stroking the water. It was the second time in as many days that we were driving thought the park. We had seen an astounding number of animals and were, by this time, well and fully sated. I had just seen that darn Carmine Bee-eater that I had been looking for for almost a week. The only thing that we had not spotted was Abe’s fabled Chobe Bushbuck. I had never even heard of this specific variant and none of us believed we would see it on this short trip. Imagine our surprise when, as we were driving along the gravel road to the east of the main throughway to Botswana, Abe all of a sudden exclaimed (at an alarmingly loud pitch): “CHOBE freaking BUSHBUCK!” The car reared to a halt as Sean hit the breaks and we all spun to the left in a frenzy, eyes wide and ready. I realise that the defining characteristics I have named here are akin to those of a kudu, a nyala, or your run-of-the-mill bushbuck, but there is no doubting Abe’s certainty. 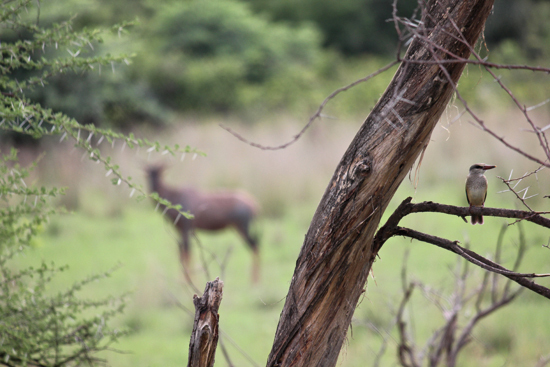 The Chobe Bushbuck could be ticked off our list. One of the most spectacular trees in the park also serves as a park landmark. The Giant Baobab is found on the eastern route next to the river. 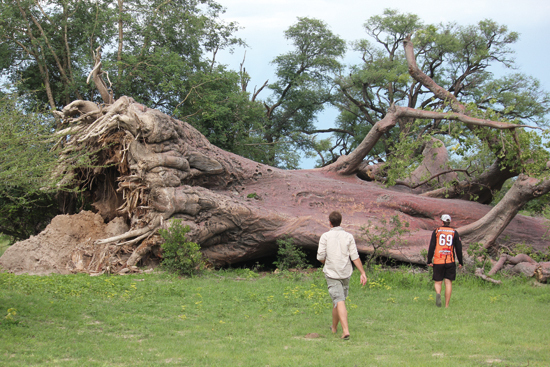 On our way to this popular spot we found a neighbouring baobab that has recently fallen over. I have no idea what natural phenomenon would cause such a gigantic tree to tumble. We stopped on the road and decided to inspect the tree which lay with its roots exposed 15 meters away. Mahango Game Park is one of the only parks in Namibia that allow visitors to exit their vehicles and explore the park on foot. I walked away from the tree so that I could get a good angle for a photo (I had my long camera lens on) while the others walked toward it to explore. As Abe headed back to the bakkie to fetch something and I peered through my viewfinder, a loud roar sounded from somewhere not too far away. All four of us were in the car within a nanosecond. Out of breath and with adrenalin pumping we slowly drove along the road that led around the fallen tree to try and see where the lion was. We never saw mane or tail of a lion. We even went back the following day after having debated the possibilities (could it have been a leopard?) to inspect the tree further. All we ever saw near that tree was an impala ram. Do impala rams roar? > The Chobe Bushbuck differs in colour from a darker variant more commonly associated with the dense coastal belt of South Africa’s eastern seaboard, and although common in Botswana is seldom seen on Namibian game drives. > Identification pointers: Small bright-chestnut to dark-brown antelope; presence of vertical white stripes and spots on sides of the body to greater or lesser extent, more so in north; broad ears; short bushy tail, dark above and white below; ram has short, almost straight horns with slight spiral and ridge. > Visitors are permitted to explore the park on foot, at their own risk, but as there are dangerous animals present, caution must be taken. Book your next stay in the Kavango region through StayToday. 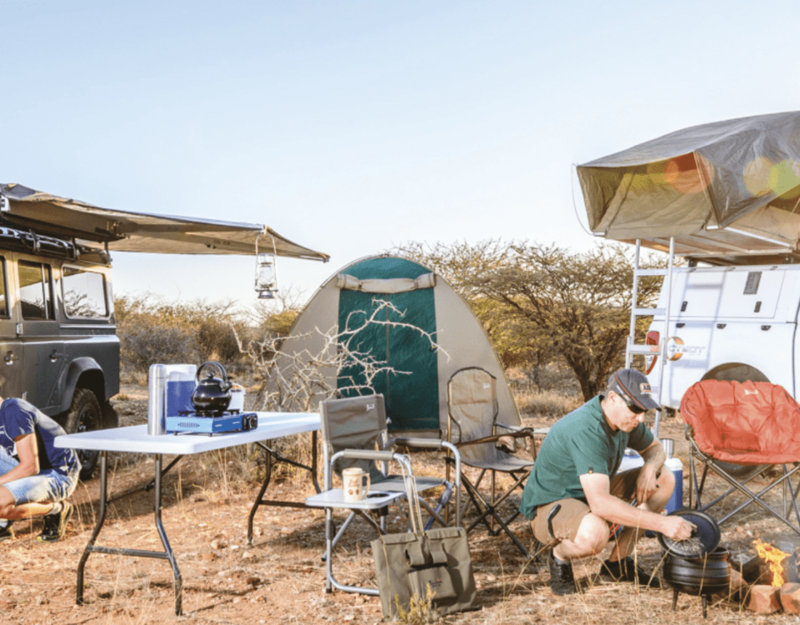 Go to www.staytoday.com.na for a variety of accommodation options, or explore the 2015 edition of Namibia Holiday & Travel magazine for community campsites in the area.